Why are the power ratings of some of the latest active loudspeakers so high? Are the components better? Or is something else going on? 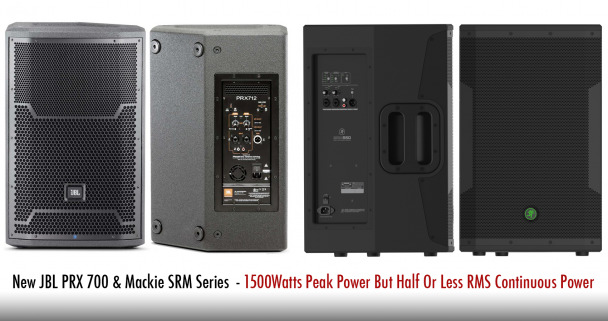 Take a look at the marketing material for the new JBL PRX 700 series and Mackie SRM series and we see power ratings of 1500W and 1600W. Compare this with the previous JBL PRX 512 and Mackie SRM450 that both have a marketed power rating of 500W. Looking at the specs for the new JBL PRX 712 and Mackie SRM550 we see that both use 2 amplifiers of half the published power rating, one each for the woofer and high frequency drivers. So the JBL PRX 712 is rated at 2x 750W and the Mackie SRM550 rated at 2x 800W. This type of amplifier design could be seen as a cost saving measure using the economies of scale to source one amplifier instead of two amplifiers at different power ratings. Other loudspeaker manufacturers such as QSC with their K and KW series also use this method. Taking a closer look at the specifications we see that the JBL PRX 712 doesn’t state whether the power rating is RMS or peak power. My guess is peak power with an RMS rating of 50%, just like the Mackie SRM550 that states 800W RMS (400W RMS for each amplifier). RMS rating is the continuous power that the amplifier is capable of outputting for long periods. Peak power is short-term power that an amplifier is capable of outputting during a short burst of high-energy. Based of these facts and my assumption, the JBL PRX 712 woofer driver is powered by 375W RMS and Mackie SRM550 woofer is powered 400W RMS. The same respective amplifier also powers the high frequency driver but this would only require 100W RMS. The JBL PRX uses the JBL 2408H-2 high frequency driver, an updated version of the JBL 2408H-1 driver used in the PRX 512 powered by 100W RMS. The reality is that the true RMS power rating of these active loudspeakers hasn’t changed much. In fact, its possible to argue the power rating of the JBL PRX712 has decreased to 475W RMS from 500W RMS with the previous PRX series. What we’re seeing is a change in way these products are being marketed where the peak power rating is being promoted instead of the RMS power rating. The difference between RMS and peak output is sometimes misunderstood. The way that these active loudspeakers are being marketed doesn’t help and can also be deceptive. I couldn’t find any details so I made an assumption. Best to contact JBL directly.